24 July : Indian women are celebrating the Hindu festival of Teej with great devotion and fervor all across the country on Friday by fasting and praying for marital bliss, well-being of household and children. There is great enthusiasm among women in celebrating the “Sawan Festival”. It follows the Hindu ritual of fasting and feasting, applying beautiful henna designs on palms and wearing colorful bangles. The festival of Teej is devoted to Lord Shiva and Goddess Parvati. Married women pray to Goddess Parvati for the well being of their spouse. 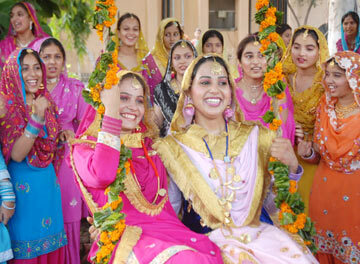 In India, there are many states that get together to celebrate Teej like – Haryana, Delhi, Punjab, Rajasthan and Bihar. BJP President Rajnath Singh has organized Teej Festival at his residence in New Delhi.